Get Ready to Take an Unforgettable Adventure! Take a boat ride underground! Listed in the Guinness Book of Records! Your Lost Sea adventure begins with a guided tour of the caverns. This involves a ¾ mile round-trip walk on wide sloping pathways. While touring the caverns and underground lake our guides will tell of the cavern’s exciting and colorful history. They will also explain the fascinating geological development of the immense cavern rooms and rare formations. At the bottom of the cave you will take a boat ride on The Lost Sea, America’s Largest Underground Lake. We are open every day of the year for tours (except Thanksgiving and Christmas Day). The tour takes approximately 1 hour and 15 minutes. Either before or after your tour you might want to visit the Lost Sea Village where we have several shops. Or take a walk on our self-guided Nature Trail. The gift shops in the Village are open seasonally. 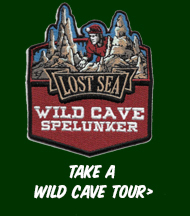 We also host a Wild Cave Tour for organizations such as Schools, Camps, Churches, and Scouts. Check out our web site, and come visit us soon! The Lost Sea is located in Sweetwater on Hwy. 68, just seven miles off I-75, exit #60. Child: $12.95 (ages 4-12). Children 3 and under are free. 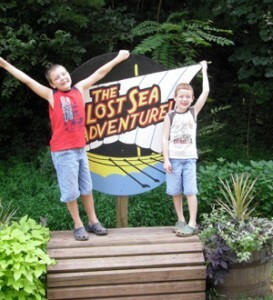 The Lost Sea is proud to be a member of the Southern Highlands Attractions, the most highly acclaimed visited points of interest in the Southern Highland Region of the United States. The Lost Sea is also a member of the National Cave Association, which stresses preservation of these glorious natural resources.